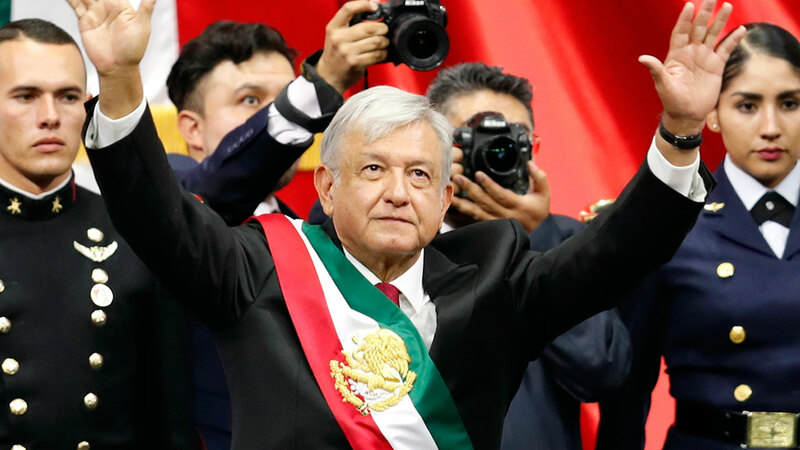 MEXICO CITY -- Andres Manuel Lopez Obrador took the oath of office Saturday as Mexico's first leftist president in over 70 years, marking a turning point in one of the world's most radical experiments in opening markets and privatization. In his first speech to Congress, Lopez Obrador pledged "a peaceful and orderly transition, but one that is deep and radical ... because we will end the corruption and impunity that prevent Mexico's rebirth." Even so, Lopez Obrador has tried to send conciliatory gestures to financial markets, which have been roiled in the weeks before he took office. But he also harkened back to his hero, President Lazaro Cardenas, who nationalized the oil industry and redistributed land during his 1934-40 administration. "We are going to govern for everyone, but we are going to give preference to the most impoverished and vulnerable," Lopez Obrador said. "For the good of all, the poor come first.'" "I want to say that since July 1, the day I was elected, I have received respectful treatment from President Donald Trump", Lopez Obrador said. Lopez Obrador said he wanted to reach an agreement with the governments and companies in the U.S. and Canada to develop Central America and southern Mexico, so people wouldn't have to migrate - "to address in that way, and not with coercive measures, the migration phenomenon." "The only person he (Lopez Obrador) can't afford to get in a fight with is Trump, because he knows he could derail his plan," said author and columnist Raymundo Riva Palacio. "He is willing to do the dirty work for them." Lopez Obrador was clear in blaming extreme market-oriented policies he calls neoliberalism for Mexico's problems. The rowdiest response from Congress came when Lopez Obrador pledged "not to persecute officials of past administrations," saying "revenge is not my strong suit." Legislators responded by counting loudly to 43 - the number of students kidnapped and disappeared in September 2014 - to remind Lopez Obrador of his promise to establish a truth commission to find out what happened to the students. He repeated that pledge Saturday. Prosecutors have said the students were kidnapped by corrupt police and turned over to a drug gang that killed them and burned their bodies. Lopez Obrador pledged to personally oversee daily 6 a.m. security briefings to confront the rising tide of violence in Mexico, and pledged to ban both oil and gas fracking and genetically modified crops. Combined with a deep sense of nationalism and his own place in history, Lopez Obrador's inauguration is the most home-grown, populist handover of power in decades. "What we want, what we desire is to purify public life in Mexico," Lopez Obrador said. "I repeat my commitment: I will not lie, I will not steal or betray the people of Mexico." The country's 65-year-old new leader is moving the presidential office fully back to the centuries-old National Palace that lines one side of the square, while refusing to live at the luxurious, heavily guarded presidential residence 6 miles (9 kilometers) to the west. He will reside instead at his private home. Yaneth Fierro, a housewife from Acapulco, expressed amazement at the luxury of the compound - there was a small cinema in the basement of one building - but disappointment at completely emptied rooms. "We wanted to see the furniture, but the 'Gaviota' (the nickname of former first lady Angelica Rivera) took them all." The handover of power began at midnight when new Cabinet secretaries were sworn in for key security posts - a tradition meant to ensure there's always someone at the helm of the army, navy and Interior Department, the country's top domestic security agency. Lopez Obrador's predecessor, Enrique Pena Nieto, leaves office with a historically low approval rating, which in several polls ranged from 20 percent to 24 percent. Pena Nieto failed to rein in Mexico's rising homicide rate or deal with thousands of Central American migrants camped out on the border, leaving both intractable issues as the biggest immediate challenges facing Lopez Obrador.